Plenary: "Our future Nature: will reintroduction play a constructive role in it?" Mark Stanley Price is a Senior Research Associate in the Wildlife Conservation Research Unit (WildCRU) at the University of Oxford, United Kingdom. Following seven years reintroducing the Arabian oryx into Oman, at that point extinct for 20 years in the wild, Mark was founder Chair of the IUCN Species Survival Commission’s Reintroduction Specialist Group (1988-2000). He later chaired a Task Force of the Re-introduction and Invasive Species Specialist Groups which delivered the 2013 IUCN Guidelines for Reintroductions and other Conservation Translocations. Between 2010 and 2016 he chaired the IUCN Species Survival Commission’s Sub-Committee for Species Conservation Planning, a global body promoting sound planning for species amongst the 130 Specialist Groups of SSC. With his experiences in reintroduction and spells with the African Wildlife Foundation, based in Kenya, and then the Durrell Wildlife Conservation Trust, he is increasingly concerned about the future and the need for realistic and predictive approaches to maintain global biodiversity. His interests are now oriented to the future for wildlife through the lens of rewilding and climate change, and global trends in human demography, politics and large scale ecology. Session 1: "Reintroductions and uncertainty: avoiding paralysis"
Session 2a: "Predicting the fates of reintroduced populations"
Doug Armstrong is the Professor of Conservation Biology at Massey University, New Zealand. He has over 25 years’ experience in reintroduction biology, and has been the Oceania Chair of the IUCN Reintroduction Specialist Group (RSG) since 1997. He has been directly involved in many New Zealand reintroductions, and specializes in combining experimental management with population modeling to make predictions to facilitate management decisions. He is a founding contributor and lecturer to the IUCN RSG's Training for Effective Conservation Translocations. Doug has published over 120 peer-reviewed papers, many focused on reintroduction and post-release management. He has co-edited two books on reintroduction biology. 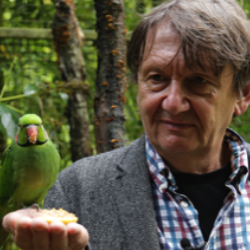 Carl Jones, winner of the prestigious Indianapolis Prize, is the chief scientist with the Durrell Wildlife Conservation Trust, and scientific director of the Mauritian Wildlife Foundation (MWF). Through 40 years of devoted and pioneering work in Mauritius, in partnership with the Mauritian Wildlife Foundation, Carl developed and led the programs enabling some of the most striking animal population recoveries in the world. The unique Mauritius kestrel, pink pigeon, echo parakeet, Mauritius Fody, Rodrigues warbler, Rodrigues fody and Rodrigues fruit bat, have all been brought back from the brink of extinction. He has also directed the restoration of several islands around Mauritius, which has included the eradication of invasive mammals, and the subsequent restoration of the native vegetation and endemic reptile communities. The work with the reptiles has required establishing exotic tortoises as ecological replacements for the extinct endemic tortoises, and by the successful translocation of three species of geckos, two skinks and a snake. Richard Hobbs is Professor of Ecology in the School of Biological Sciences at UWA, where he leads the Ecosystem Restoration and Intervention Ecology Research Group. Originally from Scotland, he has been in Western Australia since 1984, working with CSIRO and at Murdoch University before joining UWA in 2009. Professor Hobbs studies the patterns and processes of life - species and how they interact, ecosystems and how they work - and how humans intersect with and affect these species and ecosystems. In 2011 Professor Hobbs was named WA Scientist of the Year at the WA Science Awards. He was elected to the Australian Academy of Science in 2004, is an ISI Highly Cited Researcher and was awarded the Ecological Society of Australia Gold Medal in 2010. His current research focuses on “Intervention ecology: managing ecosystems in the 21st century”. Session 3: "Everything is connected: ecosystem functioning as a rationale for, and to improve the effectiveness of, conservation translocations"
Sarah Dalrymple is a Senior Lecturer in Conservation Ecology at Liverpool John Moores University, UK. She is a plant ecologist focusing on threatened species and responses to global threats such as climate change, and on the efficacy of conservation interventions. Sarah has undertaken various practical conservation initiatives including reintroduction, has reviewed threatened plant translocations, and contributed to policy documents, including co-authoring the IUCN Reintroductions Guidelines (2013) and the Scottish Code for Conservation Translocations (2014). Sarah is currently working in the conservation and forestry sector to find cross-disciplinary commonalities, opportunities to use translocations as bioassays of environmental change, and to identify use of assisted colonization to minimize biodiversity loss due to climate change. Session 4a: "Achieving political and social support for reintroductions: a communications framework"
Plenary: "Overview of challenges and opportunities for future conservation translocations"
Alienor Chauvenet is a Lecturer in quantitative ecology at Griffith University, Australia. She completed her PhD in 2012 on modeling the dynamics of translocated populations, and is currently involved in assessing the impact of changing management regimes on translocated birds’ viability. Her expertise as a modeler spans a wide range of topics, including population dynamics, habitat suitability modeling, and optimization. Ali is particularly interested in conservation decision-making and how we can improve interventions to be most cost-effective. She has published several peer-reviewed articles and book chapters on conservation translocation. Session 5: "Future opportunities: how our science can best support conservation translocations"
John Ewen is a Senior Research Fellow at the Institute of Zoology, Zoological Society of London, UK. He is a long-standing member of the IUCN SSC Reintroduction Specialist Group (RSG). John has been involved in reintroduction projects and post-release management for birds in New Zealand, Australia and Mauritius and has assisted with decision-making on reintroduction projects for birds, mammals and reptiles globally. 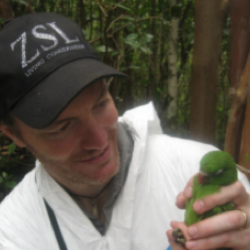 He currently chairs the Hihi Recovery Group in New Zealand and is a founding contributor and lecturer to the IUCN RSG's Training for Effective Conservation Translocations. John has published over 100 peer-reviewed papers, many focused on reintroduction and post- release management. He has co-edited one book on reintroduction biology. Session 5: "Synthetic Biology and Reintroductions: Implications for Conservation Translocations"
Phil Seddon is a Professor of Zoology and Director of the Postgraduate Wildlife Management Program at the University of Otago, New Zealand. He has been a member of the IUCN SSC Reintroduction Specialist Group (RSG) since 1994, and Chair of the RSG Bird Section since 1998. He has been involved in the implementation of reintroduction projects for mammals, birds, and reptiles in Oceania and the Middle East, and has advised on reintroduction projects globally. He was a member of the working groups that drafted the IUCN Reintroduction Guidelines (2013), and the IUCN guidelines on De-extinction for Conservation Benefit (2016). Phil has published over 150 papers, many focused on reintroduction topics, and has co-edited two books on reintroduction biology. Session 6: "Future opportunities for conservation translocation actions around the globe"
François Sarrazin is a Professor of Ecology at Sorbonne Université Paris France. He has been co-Director of the Master degree in Ecology, Biodiversity and Evolution for 13 years. Since 2014 he is the president of the Scientific council of the French Foundation for Research on Biodiversity. In the Centre for Ecology and Conservation Sciences, he runs researches on reintroduced populations, conservation, and conservation ethics. Since the 9O’s he has been working on the dynamics and viability of translocated populations of vertebrates, and particularly vultures, in Europe. As a member of the IUCN SSC Reintroduction Specialist Group (RSG) he was involved in the working group that drafted the IUCN Reintroduction Guidelines (2013). François has published over 80 papers, many focused on reintroduction topics, and co-authored one textbook on conservation biology.